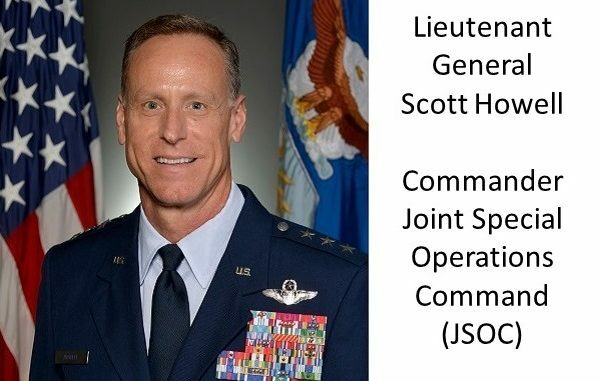 The newest commander of the Joint Special Operations Command (JSOC) is Lieutenant General Scott Howell. He is an Air Force officer and rotary wing pilot with deep experience in the special operations community. Howell is the first Air Force officer to command JSOC. Previous commanders were Green Berets, Rangers, or SEALs. Howell entered the military in May of 1987 as a Second Lieutenant after graduation from the U.S. Air Force Academy. His first assignment after flight training was with the 37th Air Rescue Squadron at Fairfield AFB, Washington. Vice Commander, HQs USSOCOM, Washington, D.C.